2016 was the warmest vintage on modern meteorological records in most of the southeast of Australia. If you wish to prove this look at the CliMate site, australianclimate.net.au, and choose the geographical site you wish to examine. Go to How’s the Season?, then Season’s Progress, then select the region you want to look at and finally select Data Type-Heat-Sum base 10C, Starting In-October, Lasting For-7 months. Scrolling down the array of curves for the chosen location will reveal the heat summation for all years back to 1949 and invariably the curve at the top by a wide margin will be 2015, which is October 2015 through vintage 2016 to April 2016. The heat summation for the 2016 growing season at the Tiers Vineyard in the Piccadilly Valley was an extraordinary 1539C days compared to the last 12 years average of 1235C days. The 2016 heat summation is way ahead of the next warmest vintage, 2010 at 1360C days. 2016 vintage was uncharted territory for me even after 47 vintages. Despite the persistent warmth there were no extreme heat events and only 13 days between October 1 and April 30 exceeded 30C and only two of these exceeded 36C. We harvested Tiers on the 12th and 13th of March, about ten days ahead of average. The sugar levels were very moderate at 23 to 23.5 Brix, the acids surprisingly held up at 7.5gpl (2 grams of malic) and pH’s remained in control at 3.2. The Tiers Vineyard was planted in 1979 with the OF Chardonnay clone, a Californian derived clone with its roots in the mists of 19th century Mersault. This clone known as FPS 02A disappeared from California because it was suspected of carrying leaf roll virus, despite recognition of its superior winemaking characteristics. It doesn’t have leaf roll, we are lucky to have it, and it is ideally suited to the distinguished site of The Tiers Vineyard. In 2016 the vintage conditions allowed it to show its best qualities. The Tiers Old Chardonnay was hand harvested into shallow trays and cooled to 2C in the cold room at Tapanappa Winery, adjacent to the vineyard. The trays were tipped as whole bunches into the Willmes Merlin airbag press and the juice was gently extracted from the berries into a settling tank. After gravity settling the partially clarified juice and its fluffy lees were racked to French Vosges oak barriques, 33% new and the balance 1 and 2 use and allowed to ferment at the cool air temperature of the Piccadilly Valley autumn. The 2016 Tiers Chardonnay was left on full lees in barrique until the summer when it was clear racked and prepared for bottling in mid March. 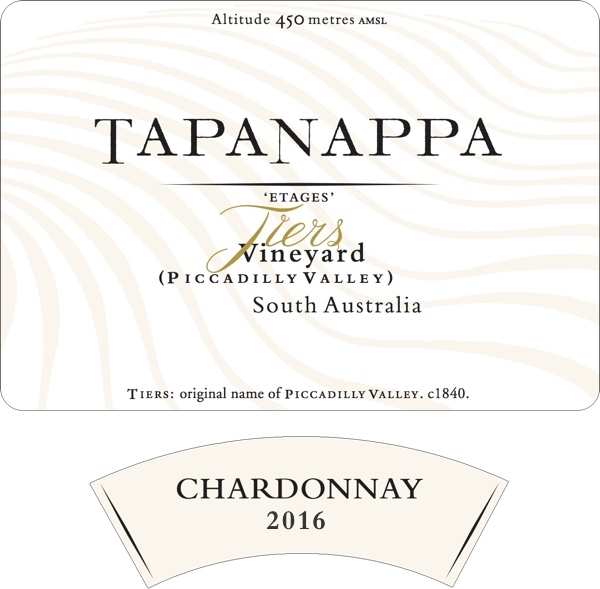 2016 Tapanappa Tiers Chardonnay ripened early and fully because of the very warm growing season. Riper honey and fig characters complement the typical Tiers Vineyard peach flavour and aroma and significant texture. The wine finishes with a grapefruit and quince nuance again typical of The Tiers Vineyard terroir expression. Bottled in February 2017. Only 500 dozen grown and made.